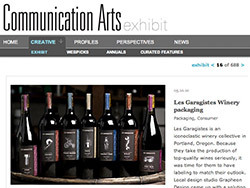 Here’s some amazing news: while I was out of the country, my design firm‘s packaging overhaul for Les Garagistes was featured in Communication Arts! “CA” (as we grizzled veterans call it) is the design industry’s premier journal, so getting showcased in it is both flattering and humbling. Thank you, CA!